On behalf of our students, staff and faculty of Mechanical Engineering at the University of Connecticut, we welcome you at a time when we celebrate 100 years of engineering excellence. The UConn ME department is thriving, with faculty and students who are recognized with the highest honors, and who are actively shaping the future of mechanical engineering. We provide a world-class education to the future generation of mechanical engineering leaders at one of the best public universities in the United States, and engage in visionary research to develop solutions to some of the world’s greatest engineering challenges. Over the last decade the department has seen its research and educational impact on a path of continued and energetic growth, placed at the center of emerging technological advancements. It has been actively recruiting world-class faculty, and is currently comprised of 24 tenured and tenure-track faculty and six professors-in-residence. Our faculty members are either internationally renowned in their fields or are rising stars who are being recognized with prominent awards. In fact, many have received prominent external recognition of their research activities through NSF CAREER, ONR Young Investigator, Army Research Office Young Investigator and Presidential Young Investigator awards. The department is growing in many different directions, including research operations, undergraduate and graduate student populations, as well as number of faculty. In fact, we’ll be on a hiring spree over the next several years as we plan to increase the number of faculty by more than 25%. More importantly, we remain focused on increasing our societal impact, and on making sure that our graduates remain well positioned and well prepared to respond to the changing nature of our industrial, political, and societal climate. This is why we maintain a strong focus on fundamental mechanical engineering disciplines, and are building critical mass in emerging fields such as biomedical systems, advanced manufacturing and materials, and sustainable energy systems. Our graduate program offers Master of Science (M.S.) and Doctor of Philosophy (Ph.D.) degrees competitively funded from external research grants, as well as an innovative and flexible Master of Engineering (MEng) degree. This intense graduate education provides depth in fundamental mechanical engineering disciplines and breadth in emerging cross-disciplinary areas. In fact, the new Engineering Science Building, scheduled to come online during the summer of 2017, has been designed around collaborative research clusters instead of following traditional departmental divisions. 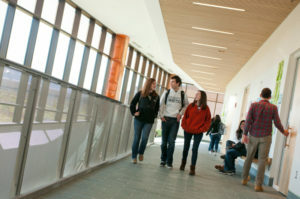 The ABET accredited undergraduate mechanical engineering program is experiencing a continuous rise in the quality of our undergraduate students, and we take pride in allowing our students to gain unique educational experiences in Connecticut and/or abroad. Our senior students participate in industry-sponsored design projects conducted in small teams, and experience the full product development cycle of industrially relevant designs: from the definition of functional requirements and brainstorming, to validation and testing. The students graduating from our department are in the enviable position of being highly sought-after by industry, and often receive multiple job offers before finishing their Mechanical Engineering degree. Furthermore, in partnership with the UConn School of Business, the mechanical engineering department is offering an accredited and integrated engineering and business program culminating in a bachelor of science degree in Management and Engineering for Manufacturing. Our research and educational endeavors are closely tied to the large number of international, high technology companies surrounding us that have a strong interest in Mechanical Engineering disciplines. Moreover, the University campus is located in a beautiful area of New England, with a moderate cost of living and proximity to major cultural, recreational, and urban centers of the Northeast. We thank you for your interest in our rising ME department program as we continue to push the boundaries of research and education and to expand our societal impact. We hope you’ll join us in this journey.